This PDF 1.5 document has been generated by Adobe InDesign CS6 (Windows) / Adobe PDF Library 10.0.1, and has been sent on pdf-archive.com on 20/03/2017 at 20:49, from IP address 24.211.x.x. The current document download page has been viewed 105 times. It doesn’t foster togetherness; it breeds resentment. les da placas y pistolas. border is tearing it apart. is not a wall - it is a system of control. 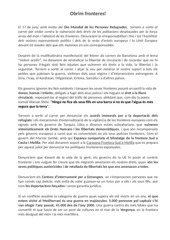 no es un muro: es un sistema de control. This file has been shared by a user of PDF Archive. Document ID: 00571942.